If you have a kid that enjoys playing Fortnite chances are, you were on the hunt for Fortnite Valentine Cards this year. Unfortunately, there wasn’t any released in-store. 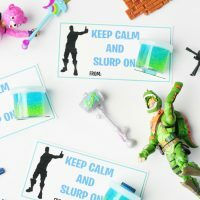 But don’t worry – we’ve made it easy to comply with your child’s demands this year and made Fortnite Slurp Slime Valentine Cards you can recreate! When my son came to me a few weeks ago asking for Fortnite Valentine Cards, after searching online, I knew we would have to make some ourselves. We racked our brains and tried to come up with something totally unique and cool and we think we nailed it. 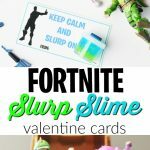 Each one of these Fortnite Valentine Cards are 4″x2″ in size (the typical size of a Valentine Card). We made the free printable so all you’ll need to do is download it, print it out on some cardstock and cut out each card. Plus, each page prints 8 cards to a page making it easy to make a bunch of these fast! Then, make the slime and attach it onto the card with some clear tape! Easy-peasy! 1″ Storage Cups (we found these on the paint isle at Hobby Lobby as well) – make sure to get enough for your child’s class. Start by printing out the free printable Fortnite Valentine Cards. For best printing, I suggest printing these on white cardstock paper. 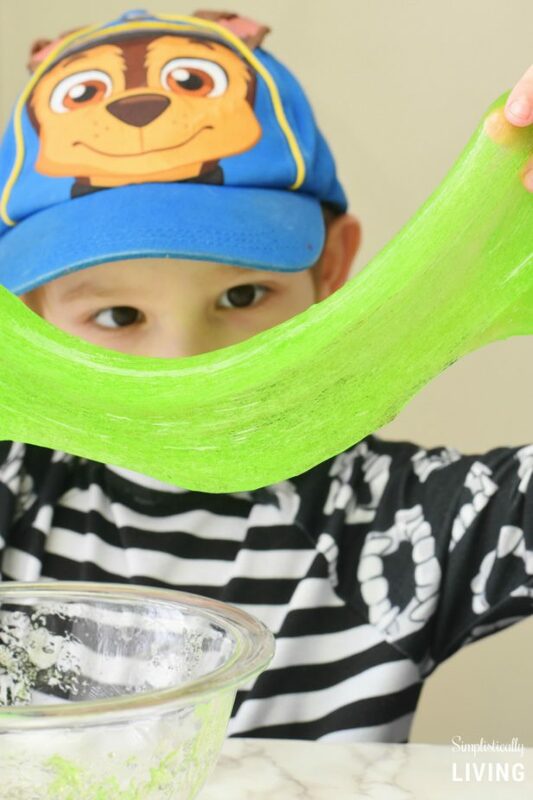 Next, make your slime using our recipe below. Tip: You will NOT use all of the Borax mixture. You need to add that slowly to your glue and stir until you reach the slimey consistency. Discard any leftover mixture. 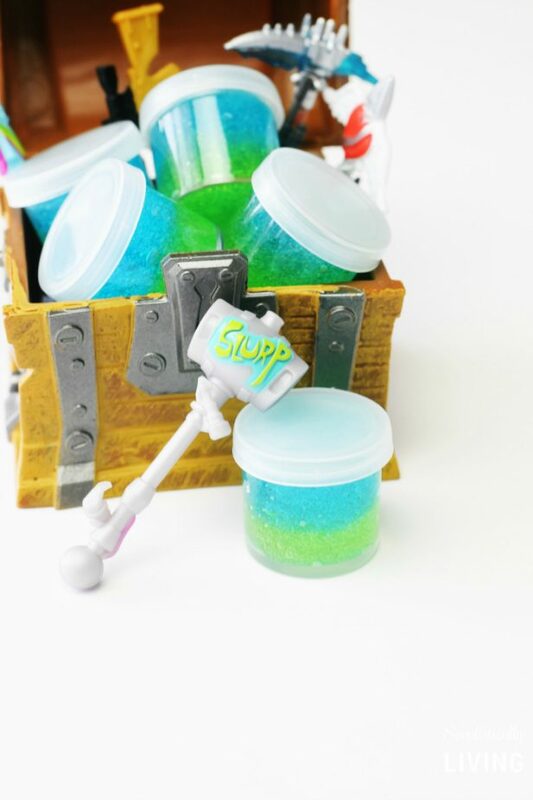 Finally, take your slime and fill each storage cup with half of the green colored slime (on the bottom) and half of the blue slime (on the top). Close the lids tightly and then use tape to attach the slime filled storage cups right on top of the Valentine Card. 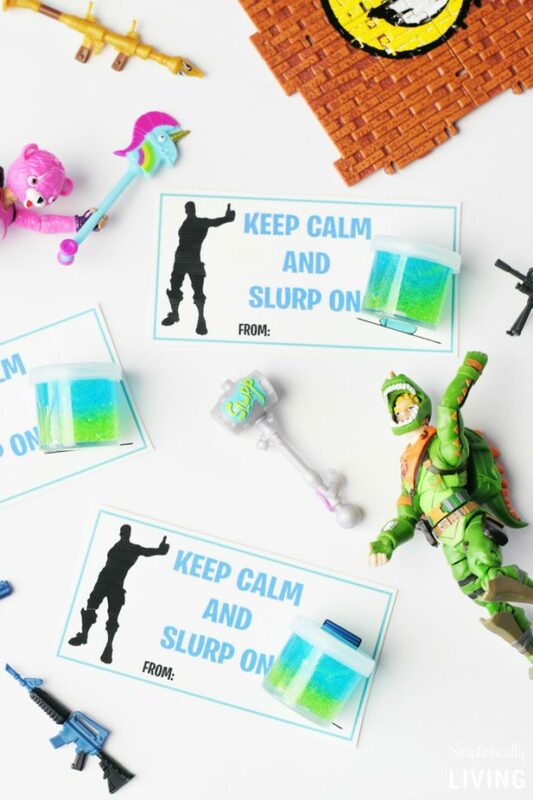 We placed it directly over the image of the Slurp Slime on the card. Have your child fill out their name next to the “From” box and they are ready to give for Valentine’s Day! We hope you and your kids love this Valentine craft as much as we did! Want more Fortnite? 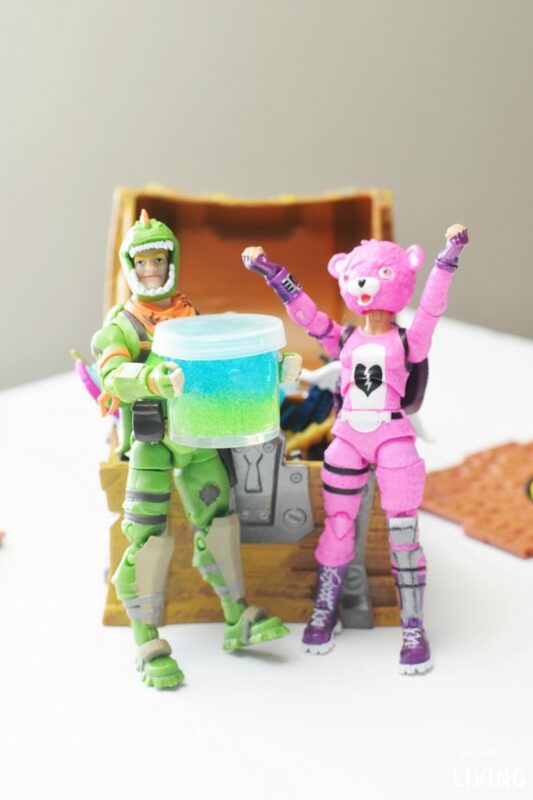 Check out our Fortnite Slurp Juice Recipe Here! 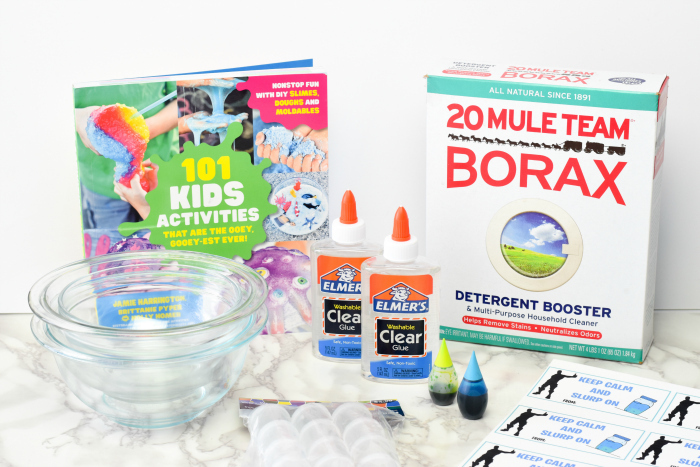 In a small bowl, mix your borax powder and 1 cup of warm water. Stir well until the borax powder is dissolved and set aside. Evenly divide your clear glue into 2 separate bows (4 oz in each bowl). Pour 1/2 cup of warm water into each of the bowls from step 2 (this is your remaining 1 cup of water). Stir well. 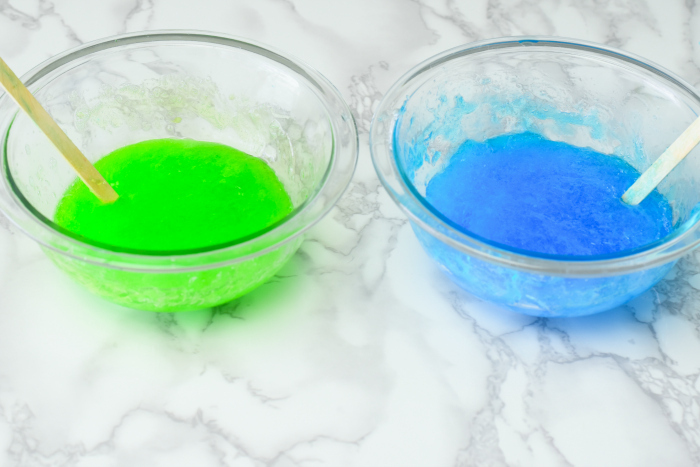 In one bowl, add the neon green and green food coloring and stir well. In the other bowl, add the blue food coloring and stir well. 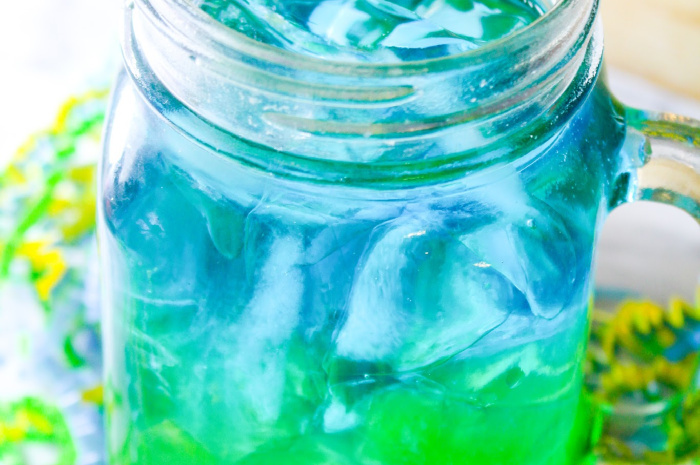 Next, take your borax mixture and slowly pour some into the green colored mixture. Stir well. Be careful to not pour too much or you will ruin your slime. Repeat step 6 with the blue colored mixture. 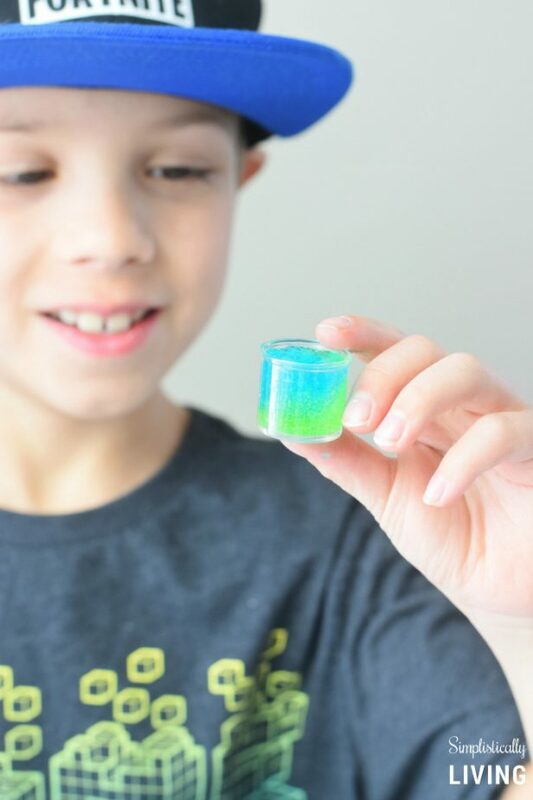 Once your slime is made, add half blue slime and half green slime into each storage cup (put the green slime on the bottom and blue on top). 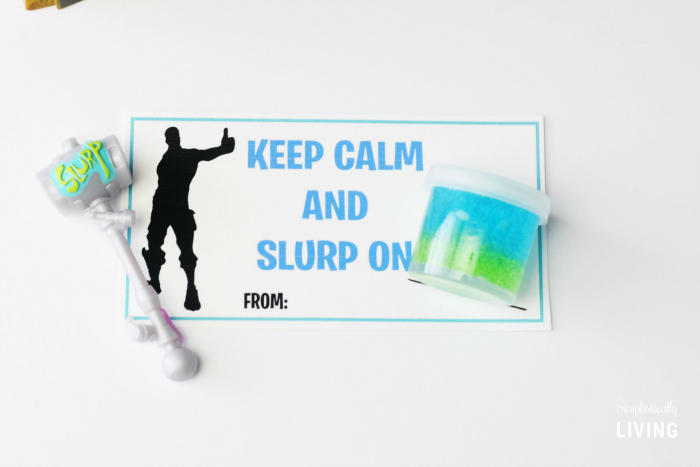 Print and cut out your Fortnite Valentine Cards using our free printable. Don't forget to have your child sign them! Attach the storage containers filled with slime onto each card using the tape. Gift these totally cool Fortnite Valentines to all your friends.